This European made laminate flooring is Greenguard Gold certified for healthier homes. The product is 12mm thick and has an AC4 melamine wear layer impregnated with Aluminum Oxide for added resistance against wear. Offers a triple warranty against staining, fade and wear. Russet Meadow Hickory's realistic texture and visual appeal work together to achieve the look and feel of real hardwood. With a light, neutral colour that complements any decor style, this laminate flooring is backed by a limited lifetime warranty and features a durable, ultra strong AC4 wear layer that protects against scratching, fading and staining. Appropriate for residential and commercial use, this design is easy to install in any home with its user-friendly locking technology. 12mm Goldwyn Hickory Laminate Flooring (16.57 sq. ft. / case) This European made laminate flooring is Greenguard Gold certified for healthier homes. The product is 12mm thick and has an AC4 melamine wear layer impregnated with Aluminum Oxide for added resistance against wear. Offers a triple warranty against staining, fade and wear. 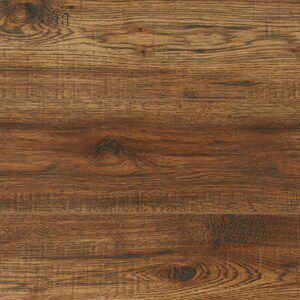 12mm Goldwyn Hickory Laminate Flooring (16.57 sq. ft. / case) is rated 3.7 out of 5 by 271. Rated 5 out of 5 by HomeDepotCustomer from This flooring stands up well to dogs and rural living.... This flooring stands up well to dogs and rural living. We have had it for 4 years and just completed one more room. Easy to install. Rated 5 out of 5 by Bob53047 from Easy installation and finished floor looks fantastic.... Easy installation and finished floor looks fantastic. Rated 4 out of 5 by KelliH1983 from A little more difficult to install than the name brand.... A little more difficult to install than the name brand. But it looks just as good. Rated 3 out of 5 by Cl from Little tough to work with. But good for the price.... Little tough to work with. But good for the price. Rated 4 out of 5 by DecoratorPro from If you like traditional look, this is the right color for you. Good quality for what you paid for... If you like traditional look, this is the right color for you. Good quality for what you paid for if you can't afford engineering wood floor. We installed it in the bedrooms and put a nice area rug on top, can't tell is laminate flooring. Rated 3 out of 5 by Mike from Good, but pay attention This flooring looks nice and feels good and sturdy. I like the texture of the surface and the seams meet nicely. Most pieces lock together easily. I've installed around 1000sqft of this floor and have had probably 10 pieces of out that that looked fine but would not lock together correctly. This was frustrating because you can't just look at the piece to tell if it will fit or not. When you go to install you'll be able to tell but if you're not paying attention you won't notice it and it'll cause issues further along. When the don't meet it seems if you lock one end in, the other will pop out and if you do get both ends in the seam is raised higher than normal. Otherwise the floor seems sturdy and I anticipate it holding up well. Does this product have a little red in it? Or just brown? Thank you for your interest in Goldwyn Hickory laminate flooring. This flooring has a warm amber colouring with some reddish-brown to brown overtones. Please take home a hand sample from your local Home Depot store to ascertain whether or not the colouring meets your needs. Alternatively you can purchase one box of Goldwyn Hickory to assemble a larger test area of flooring in your home. looking to see if you by chance have anything close to a Bakersfield chestnut color in laminate flooring? Please compare the in stock and special order displays at your local Home Depot store to select the closest match to the colour you are seeking. can you tell me if this flooring is rated an AC4, if not what is it? do you carry in your Halifax store and can the public walk in and buy this? I am looking at purchasing 353 sq ft of flooring. Thank you for your interest in Goldwyn Hickory laminate flooring. This flooring has an AC4 rating and should be in stock at your local Home Depot store in Halifax.